Today we will help you find the best seven foot Harvard Air Hockey table. Air Hockey is a thrilling activity. The elements of Air Hockey have excitement and crazy randomness at its heart. When you play Air Hockey, you want to be the first player to reach seven points. However, nothing is stopping you from changing the points you want to play to when playing with friends and family. It is a pastime that will surely pass the time in a very enjoyable manner assuming you have good equipment. Every game will be different from the last since the puck (the scoring object) can be very unpredictable as the speed of play increases. The question is, can you keep up with the heat?! There are lots of brands of Air Hockey tables and just as many, if not more, models available. In this article, we will be focusing on Harvard produced Air Hockey tables. More specifically, 7-foot tables. One thing that is important to understand before we continue, however, is that Harvard is part of a greater company called Escalade Sports; this is important because there are varied brands under the parent company. Since they are all owned by the same parent company, we will include various tables of several brands. The important thing to keep in mind is what counts when it comes to the quality of the table. You need to understand what features a table has, how durable it is, how effective it is for playing on and so on. Make sure you consider everything each table has to offer. Doing this should ensure that you make a more intelligent decision when it comes to the selection process. We hope the following list will make it easier for you to know what is available and understand the differences between each option. The Harvard Action Arena Air Hockey table is the best option for a more secure playing experience. It has 3-inch wide rails to help keep the puck where it belongs; in the arena (the playing surface). The PVC laminated glossy playing field works with the 11-volt fan blower. The effect is a solid layer of air which makes sure that the puck can glide across the surface easily. The legs were designed with stability in mind and can be adjusted for surfaces that are not quite even. The table comes with four strikers, as well as four pucks. The American Legend Enforcer Air Hockey table is the best option for people looking for a style that stands out. With the Abacus-style scoring on the side, the goal ends are more comfortable to place your hands when playing. The design of the playing area has a good balance of kick. If you want to increase the style, hook up the banner/apron it comes with to make a statement that you are serious about playing an intense game of Air Hockey. This table features not one, but two blower motors to make the experience go into overdrive. The aluminum rails will give the quick bounce response most players want to see; this helps make your shots more effective. An extra set of strikers and three extra pucks are included to help keep your investment secure. The Atomic 2-in-1 Air Hockey table is the best solution for those who want to conserve on their game room space. Now you no longer have to go out to a bar to play Billiards or Air Hockey. With the Atomic 2-in-1 Air Hockey table solution, you can switch between 2 of the coolest tabletop games. The air powered Air Hockey table can convert to a solid and stable Billiards playing surface in just a few seconds. All you have to do is rotate the playing surface, and it will transition into miniature billiards. It comes with fifteen billiard balls, two pool cues, and a cue ball to ensure a full experience. The Atomic Blazer Air Hockey table is the best option for people who want a solid looking table with good features. You can rest assured that the gameplay will be fast paced with its strong 120V blower. The rails are designed to reduce the vertical bounce, so you don’t have to keep stopping the play due to having to pick up the puck from the ground over and over. This table is flexible with uneven surfaces, so you won’t need to find something to stick underneath the legs to keep it steady. Great looking black and white surface area is nicely complemented by the solid black pucks and mallets. If you want a good Air Hockey experience, look no further than the Atomic Blazer to light up your night. 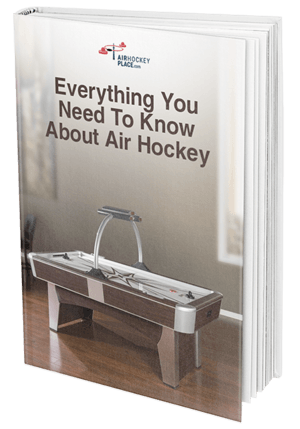 The Harvard Arctic Ice Air Hockey Table is the best solution for those who want the top of the line table for their home. Its laminated PVC playing surface, along with the strong 110-volt Fan will provide a full air bed to keep the puck gliding smoothly and quickly across the playfield. The 3 3/4-inch side rails along with the 1-inch deep surface will allow precision bank shots fully taking advantage of this table’s length. The tapered down 8-inch legs each have their own levelers to provide maximum flexibility on plenty of different floors. The style is clear and distinct with white, black, and gray tones. It is a great look for a basement or bar room. With this list of Harvard Air Hockey tables, you can make an informed decision. We provided different solutions for different people. If you know what you are looking for, you should be able to find something from the list. We think option 4 (Atomic Blazer) and option 5 (Harvard Arctic Ice) are the best. Option 4 provides excellent value with its solid style and fancy score tracker. Option 5 allows you to maximize your Air Hockey experience with plenty of room for all kinds of shots and will last through the aggressive and fast paced action for years to come.